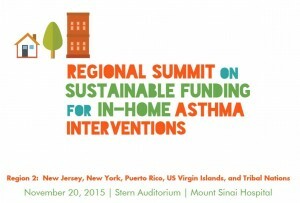 On November 20, 2015, Mount Sinai hosted a regional asthma summit sponsored by EPA Region 2. Featuring an exciting line-up of expert panelists and speakers, the summit focused on sustainable reimbursement opportunities for in-home asthma interventions. This conference was a collaborative effort between city, state, and federal agencies, community stakeholders, and medical and public health professionals. Please view our event page here. This entry was posted in Feature of the Month on November 25, 2015 by mountsinaitceee.